Hope the gumflappers are listening, particularly the bears! Last night, the Advance-Decline Lines for the NDX, NYSE, MID, & SPX all closed at record highs. Those who are still waiting for a "test of the December low" are waiting for Godot. My work continues to suggest there is not much downside risk here with the grind higher likely to extend into June on an intermediate-term basis. Last week’s rally put some distance between the much watched 2800 level on the S&P 500 and last Friday’s close. Still, the SPX has not broken out to the upside. What has happened is that last week’s wobble created a double bottom in the charts. The first low came last Monday (3-25-19) at ~2785. The secondary low came on Wednesday (3-27-19) at 2787. From there, the SPX rallied some 49 points into Friday’s intraday high. Despite the end of the quarter ebullience, my work continues to show there are doubts about the SPX’s ability to breakout above the March 21, 2019 intraday high of ~2860. That suggests the SPX may just consolidate in a sideways fashion. Accordingly, it will be interesting to see what happens this week now that quarter end’s window dressing is over. So, strategically, the “call” for a grind higher into June looks to be correct. However, the tactical “call” about doubts that the SPX can break above its March 21 intraday high on this move was clearly wrong. 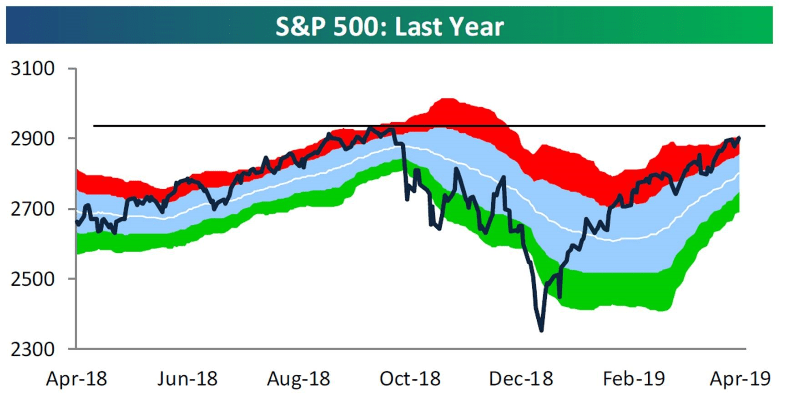 The recent rally has left the S&P 500 Total Return Index at new highs, begging the question can the S&P 500 market cap weighted do the same thing? I think it can. 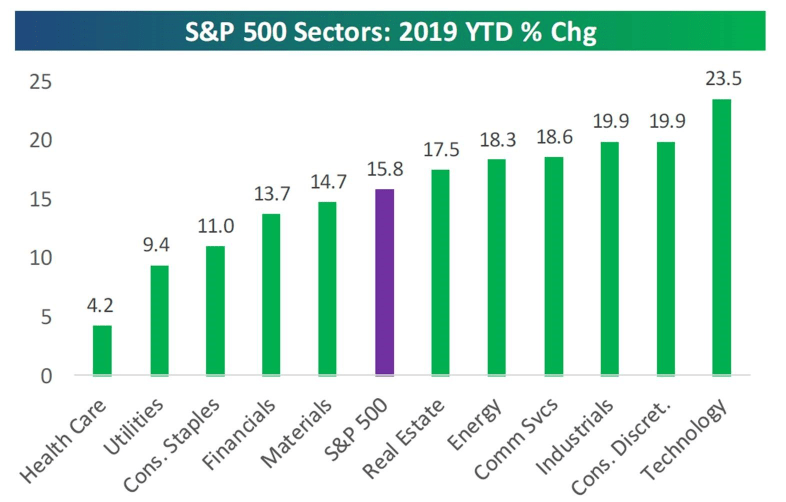 Pointing the direction was the fact that a number of S&P 500 sectors made new 52-week highs last week with Technology, Communication Services and Real Estate being the standouts (chart 1 below). The rally, however, has left many of the indices I monitor overbought on a short-term trading basis (chart 2, page 3). This suggests that the SPX could potentially stall for a few sessions as its internal energy gets rebuilt for another vault higher, which is what my work points to. That does not mean there are reasons to “sell” here, but rather a bit more caution in chasing stocks higher. The call for this week: My work suggests a touch of caution here on a trading basis. My short-term internal energy indicator is out of gas. The intermediate energy indicator is neutral, but the long-term energy indicator remains highly bullish. The SPX is in a position, after a pause, to trade above its all-time high (~2940) and trade above my often mentioned target of over 3000. Regrettably, very few participants believed it, imbibed by Wall Street pundits’ chants of stock market crash, recession, an earnings recession, too much optimism, well you get the idea. The problem remains that there are not enough of us that are old enough to remember the 1949–1966 or 1982–2000 secular bull markets! In both of those secular bull markets, there were declines of over 30%, but it did NOT end the bull market. This week is expiration week, which will be interesting to watch given that the market will be closed for Good Friday. First quarter earnings results arrive this week that could give stocks an upward bias, yet my work still suggests a stall. Additionally, it is Golden Week in Japan with their markets being closed for sixsessions. This morning, the S&P 500 futures are flat as U.S. negotiators tamp down demands with China on a trade deal. Additional information is available on request. This document may not be reprinted without permission. Raymond James & Associates may make a market in stocks mentioned in this report and may have managed/co-managed a public/follow-on offering of these shares or otherwise provided investment banking services to companies mentioned in this report in the past three years. RJ&A or its officers, employees, or affiliates may 1) currently own shares, options, rights or warrants and/or 2) execute transactions in the securities mentioned in this report that may or may not be consistent with this reports conclusions. The opinions offered by Mr. Saut should be considered a part of your overall decision-making process. For more information about this report  to discuss how this outlook may affect your personal situation and/or to learn how this insight may be incorporated into your investment strategy  please contact your Raymond James Financial Advisor. All expressions of opinion reflect the judgment of the Equity Research Department of Raymond James & Associates at this time and are subject to change. Information has been obtained from sources considered reliable, but we do not guarantee that the material presented is accurate or that it provides a complete description of the securities, markets or developments mentioned. Other Raymond James departments may have information that is not available to the Equity Research Department about companies mentioned. We may, from time to time, have a position in the securities mentioned and may execute transactions that may not be consistent with this presentations conclusions. We may perform investment banking or other services for, or solicit investment banking business from, any company mentioned. Investments mentioned are subject to availability and market conditions. All yields represent past performance and may not be indicative of future results. Raymond James & Associates, Raymond James Financial Services and Raymond James Ltd. are wholly-owned subsidiaries of Raymond James Financial. Investors should consider the investment objectives, risks, and charges and expenses of mutual funds carefully before investing. The prospectus contains this and other information about mutual funds. The prospectus is available from your financial advisor and should be read carefully before investing. Securities offered through Raymond James Financial Services, Inc., member FINRA/SIPC. Investment Advisory Services are offered through Raymond James Financial Services Advisors, Inc. and SAGE Private Wealth Group. SAGE Private Wealth Group is not a registered broker/dealer and is independent of Raymond James Financial Services.